Chloroplasts are the source of virtually all of the world's food and fuel and much of its oxygen supply, and as such life on Earth depends on them. They are a vital component of all photosynthetic cells in plants and algae, and are unique to them. What makes them so important is that they are the sites of photosynthesis, from the absorption of light by chlorophyll through to the production of the first simple sugars. It is chlorophyll that gives them their characteristic green color. They are present in all green-colored cells of a plant; not only in leaves, but also in green stems and green parts of a fruit (for example, in an apple peel). Chloroplasts are approximately 4 to 6 micrometers in diameter and shaped like a satellite dish with the concave face toward the light. This shape, together with their alignment along the inner surface of the cell, maximizes their ability to capture light. Depending on the plant species there can be as many as two hundred chloroplasts in a cell. A chloroplast is enclosed by two membranes, which together are termed the "envelope." Inside are two distinct features: a complex organization of folded and interconnecting membranes, called the thylakoids, and a protein -rich fluid region called the stroma. The proteins and pigments (chlorophyll and carotenoids) involved in the light reactions of photosynthesis are located on the thylakoid membranes. The enzymes involved in the conversion of carbon dioxide to simple sugars (the "dark reactions") are found in the stroma. Together these reactions convert carbon dioxide and water to sugars and oxygen. 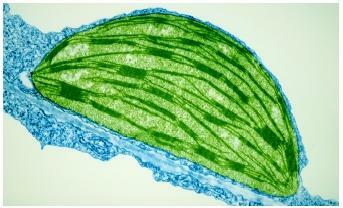 A false-color transmission electron micrograph of a chloroplast from a tobacco leaf. even make many of the proteins needed to produce another chloroplast. They are thought to have been originally free-living, single-celled photosynthetic bacteria, which became engulfed in a nonphotosynthetic host cell. At first, the two cells lived symbiotically, where each was an individual organism that derived some benefit from the other. Eventually, through evolution, the bacteria lost more and more of their ability to live independently and became the chloroplasts we recognize today. Many pieces of evidence support the endosymbiotic theory. Chloroplasts, for example, contain deoxyribonucleic acid (DNA), the entire sequence of which has been determined in a number of species. Chloroplast DNA codes for a number of essential chloroplast proteins. Over time, large parts of the DNA of the original bacterium have found their way into the nucleus of the host cell, giving it control over many of the functions and features of the chloroplast. Genes involved in controlling the division, and hence "reproduction," of the chloroplast are now present in the nucleus. The composition of the DNA and the way in which it is translated resembles that of bacterial cells, adding further support to the endosymbiotic origin of chloroplasts.